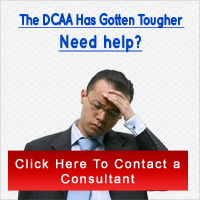 Your DCAA timesheet may be one of the most demanding tasks when it comes to surviving an audit.Â However, it isnâ€™t enough for just you to understand the DCAA timesheet regulations.Â Many firms fail audits because of problems their employees make.Â This can be avoided with a good training program. The first thing that employees need to understand about their DCAA timesheets is that they, the employees, are responsible for them.Â No one else is allowed to fill in his or her timecards.Â After clocking in and out, the employees must turn over the DCAA timesheets to a supervisor for approval.Â The timesheets will then be signed by the employees and the supervisor. If an employee is out on travel status, then the employeeâ€™s supervisor has the right to prepare the DCAA timesheets.Â However, when the employee returns, the employee must submit his/her timesheets and attach them to the ones which the supervisor prepared.Â Only if the employee is away for extended authorized periods of time is the supervisor allowed to complete the employeeâ€™s DCAA timesheets. It is important that employees understand that it is their job to keep accurate DCAA timesheets to a minimum of 1/10 of an hour.Â If they fail to do this, then they are subject to disciplinary action as part of the company policy.Â Even though your employees are responsible for their own timesheets, you as a business owner are responsible for making sure that they comply with DCAA timesheet regulations.Â If a DCAA auditor finds some discrepancy or error in the timesheets, then you are the one to blame. Remember that the most important part of your DCAA audit has to do with timesheets and accurate cost-tracking methods.Â In order to make sure that you are in compliance with DCAA timesheet regulations, you will need to train your employees and make sure that they understand the rules and policies as well as the consequences. If you are using DCAA software for your timesheets, you must also make sure that all your employees are trained on how to use it.Â When choosing your software, you will want to take into consideration whether or not it has a training program included and how easy the DCAA timesheets software is to use.Â Timekeeping can become very complicated because of overtime, employees offsite, and other issues.Â The DCAA has many different training courses on their website, which can help with DCAA timesheets compliance. Remember that, even if you are familiar with DCAA timesheets regulations, it doesnâ€™t mean your employees are.Â Make sure they are trained so you donâ€™t fail your DCAA audit because of timesheet problems.